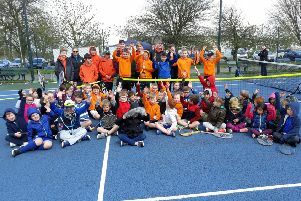 Melton Mowbray Tennis Club’s players took a breather from league duty to represent their county teams at the Annual Summer County Cup week. Ladies’ club captain Charlotte Griffin and team-mate Corinne Blythe both travelled to Southsea to compete in Group Three with Leicestershire. After a gruelling five days of matches, the ladies were rewarded for their tremendous team spirit by clinching the runners-up spot behind Hampshire, and promotion to Group Two for 2019, after a dramatic 5-4 win in their final match against Nottinghamshire. Charlotte was involved in all five matches and finished with eight wins from 14 matches, while Corinne recorded four out of eight wins despite a troublesome shoulder injury. Wins over Berkshire, Cambridgeshire, Buckinghamshire and Nottinghamshire were enough to guarantee promotion with just the one defeat to the group winners. Melton clubmate Laura Cooper lined up on the opposing Notts team. Laura has struggled with injuries throughout the summer and had to play a supporting role this year for Notts who finished fourth and retained their place in Group Three. * On the men’s front, Melton were represented by Ben Mactaggart, Eban Straker-Meads and Marcus Walters who all turned out for Nottinghamshire in Group Five at Cambridge. They also helped their county to success, finishing as runners-up to a strong Dorset team, but gaining promotion to Group Four. Ben was involved in three matches, collecting seven out of seven wins, while Eban played all five days, collecting 11 wins from 14. Marcus was again in fine form and was also involved in all five days, finishing with 12 wins out of 14. Wins over Staffordshire, Hereford and Worcestershire, Oxford and Warwickshire gave them promotion with just the one loss against Dorset.